LOVELY HOLIDAY HOME WITH PRIVATE HEATED POOL. LARGE GARDEN. CLOSE TO MOST FACILITIES. Tal como no ano passado, a casa tinha todas as condições para umas excelentes férias. O espaço exterior bem cuidado, a piscina sempre limpa, é mesmo um luxo poder passar férias com estas condições. Agradeço todo o apoio que nos deram e, provavelmente, até para o ano. just 1.5kms away from Vilamoura Center, Walking distance to all facilities. Master bedroom with en-suite bathroom - on first floor. ( safety deposit box in Wrobe) Groud floor: cloak room, a separate shower room ( pepared for eldery people and desable ) Next to 2 bedrooms- separate spacious walking shower , prepared for eldery and desable people . Tere is a large open plan living/dining area with French windows to terrace and pool area, a central open fire place (just for decor), Air con cable TV, internet access , CD, DVD. Modern and very well equipped kitchen. ROOF TERRACE. REACHED FROM DOOR ON FIRST FLOOR NEXT TO DOUBLE BEDROOM. WHICH IS CLOSED FOR THE SAFETY OF SAMLL CHILDREN. Golf courses very close. Tchu tchu trains around Vilamoura at a very resonable fee. We and our grandchildren had a wonderful holiday in the neat and complete house. The people who take care of the house and the garden were very friendly and helpful. As an example, we were regularly attacked by a jay and when we told this, a false owl was placed in the evening. As a result, we did not see the Jay again. The house was perfect for what we needed. It was spacious and clean. This was our second abroad holiday, going on experience of a freezing cold pool in a hotel complex last year, we paid for the heated pool which meant the kids were in there all day! It's in a good location, away from the main centre but not too far away. It was a 10-15 minute walk to the nearest spar, or a further 5 minutes passed burger king and you'll get a better supermarket. A further 10 minutes beyond spar to the marina and there is plenty choice of restaurants down by the marina. There is building works going on right oposite the accommodation, but to be honest it wasn't that bad you would barley notice that they were there. We spent pretty much all of our time in the villa, and had a great holiday, I would definitely go back. From the moment of arrival we felt home in Vilamoura and in our holiday house. At first we spend a couple of days with 4 people, later we were 8 which is still a suitabel number for the accommodation. We enjoyed the beautiful garden, the pool and the house. The description was pretty accurate. The property was very clean and well maintained. Generally we experienced good customer service. The house is in a quiet living area of Vilamoura. We felt it is good to rent a car to explore the region of Algarve. We definitely would recommend this property to friends or relatives. Our family from South Africa which joined us in Portugal were very happy, too. Thanks to Maria with who the communication was always very fast and efficient. We did have a disappointing start to our stay at the villa. The pool had very obviously not been cleaned for our arrival, the booking was for 9 people but we were only left 5 sets of bathroom towels & there was not a fan in every bedroom as promised / listed in the facilities. 1st impressions really do count so it was disappointing. That aside once the issues had been resolved the villa was lovely. It has a lovely outside area & is well equipped inside. Other reviews from last year commenting on required maintenance had obviously been noted & acted upon. The villa is in a lovely cul de sac, approx 10 min walk to the nearest supermarket & a selection of bars & restaurants, another 10 mins past that to the actual marina. Bonus points were that we could get into the villa earlier than stated check in time & there were a good selection of beach/pool towels available to be used. I had actually queried this shortly before our stay & was told there were none available so it would have actually been helpful to have known that this wasn't actually the case! Minor negatives; Vanda the housekeeper doesn't speak English but we were able to make ourselves understood. There is still building work opposite, but they certainly weren't there everyday nor all day. In fact it was quite entertaining watching the lack of health & safety! We were a party of 9 but there were only 7 sunbeds available, when I queried this I was told legally they only have to provide sunbeds for half max occupancy. Its a shame for the sake of a few euros they dont provide sunbeds for every guest. The security deposit arrangement is very inconvenient - who wants 500 euros in cash handed back as you are leaving to come home?! Why it can not been done by electronic transfer such as paypal as other places we have stayed i do not know. TAKE YOUR OWN BEACH (POOL) TOWELS. must have half, which in this case where 7. Vanda is a good house keeper but she doesnt speack English, which is not an issue. We were a group of 7 friends and had a fantastic few days at this villa. Beautiful outside seating area, pool was large and deep and sunbeds for everyone with enough outside spade that we weren't on top of each other. Would agree with other reviewers about the outside rooms - one of our party did get locked in, however they were very well equipped with a beautiful bathroom. The kitchen was also well equipped although some washing up liquid and a dishcloth would be a welcome addition as would a cafetiere but these are minor points. All in all we had a fantastic few days, found Maria to be very helpful and accommodating. Millenium, a new exciting 18 hole course designed by UK architects Hawtree & Sons. Laguna, the most recent of the Vilamoura courses, this course has three loops of nine holes each that are an enduring challenge for any player. 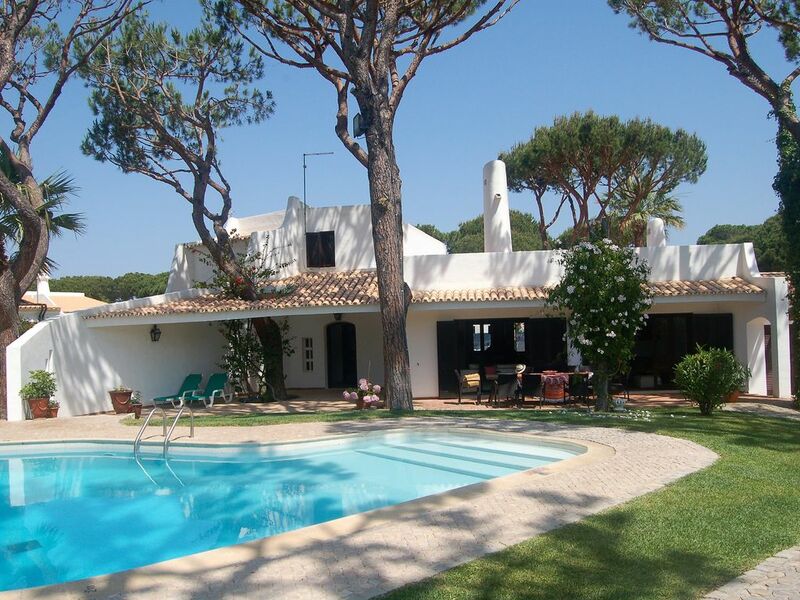 Pinhal, in the middle of a beautiful pine wood, with panoramic views to the sea. Old Course, the oldest of the three Vilamoura courses that form part of a luxury resort close to fantastic beaches - a Par 73 course set in beautiful and tranquil landscape. 1.5km approx to Vilamoura beach and marina. From city of Loule - 14km. WINTER LET AVAILABLE - FROM NOVEMBER 2019 TILL END MARCH 2020 PRICES ON PRICE LIST ARE FOR 6 PEOPLE + 1 BABY. THE 2 EXTRA BEDROOMS AVAILABLE AT EXTRA CHARGE. PLEASE ASK FOR QUOTATION. 6 + 4= 10 PEOPLE MAX OCCUPATION + 1 BABY COT AVAILABLE AND HIGH CHAIR NEVER BOOK BEFORE YOU DISCUSS TERMS AND CONDITIONS . THERE MUST BE AN AGREEMENT BETWEEN GUESTS AND OWNERS Change over day - on Saturdays during July & August.Out of July & August flexible day of arrival -Pool heating-150€/weeK ELECTRI MOBILE HEATERS - 5 AIR CON ON REQUEST ( COLD & HOT AIR ) - ONLY IN LIVING DINING AREA- 35 €/WEEK FINAL CLEANING- 50€/ PAID TO THE HOUSE KEEPER- END OF YOUR STAY HAMPER ON ARRIVAL BREAKAGE DEPOSIT ON ARRIVAL IN CASH, RETURNED TO YOU BY THE END OF YOUR STAY BY HOUSE KEEPER.